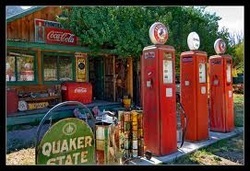 The gas station was old and worn down from neglect. The pumps were relics, the volume and cost read like the face of an old alarm clock, and the parking lot was splotched with weeds that grew from the cracks. A small convenience store was connected to the car garage, and along the side of the station was a bathroom and a padlocked ice chest. That was where the day laborers stood. Gathering each morning at the break of dawn, talking amongst themselves while drinking coffee. They wore faded blue jeans, short sleeve shirts and steel towed work boots. They were brown, their skin, the dirt on their clothes, their hair. Waiting. They gathered around one man, in particular. He was a head higher than the others from where he stood on the curb. He had a short black mustache and wore a beaten cowboy hat with a leather tassel, his face old and sunburned. A cheap tattoo on his forearm. The men around him cracked jokes, but he seemed disinterested. His eyes focused on a man standing by himself next to the vacuum and air pump. A young man, brown like them. He was short with cropped black hair tucked beneath a red baseball cap. He looked shy. Carlos cocked his cowboy hat back. The men had stopped talking, all attention now turned toward him. Why do you stand over there? Soon two trucks pulled off the road and into the parking lot and stopped in front of the men, the engines still running. The foreman got out of the first truck and stood on the chrome foot step, his hands on the top of the roof. He wore a fancy cowboy hat and a flannel buttoned shirt. He was well groomed, his face stern. Carlos stepped off the curb and said. Carlos smiled and hopped up into the back of the second truck and the foreman, looking the men up and down, began to count them off. One by one they climbed into the back of the trucks, ten, eleven, and his eyes fell upon Eduardo and he squinted. And Eduardo jogged towards the truck and got into the back and sat down facing the men on the other side. The foreman came around the back and shut the tailgate and smiled at them. You boys ready to work? He spit and walked back to the driver's side and got in and stuck his hand out of the window and waved the truck behind to go ahead. It pulled around them, the workers each looking at the others as it passed as if in a resigned acknowledgment, and then the truck rolled out of the parking lot and sped down the highway while Carlos, sitting in the back, took off his hat and waved. Eduardo still sat with the others, the engine idling. The men not picked were beginning to disperse. A younger man come out of the store with two plastic bags filled with drinks and snacks, and he opened the door on the passenger side, said something to the driver, a laugh, and the truck shot forward, sliding the workers across the plastic lined bed. The truck picked up speed and headed down the highway. The gas station was now empty amongst acres of green farmland like a small island, the suns first rays bearing down upon it. A lonely crooked sign at the entrance that read: Liv Bait. The high pitch whir of an air wrench echoing from the garage. Sitting shoulder to shoulder, they held their hats on their heads as the brims flapped madly in the wind. The large soybean fields rolled past, a green crop sprayer dwarfed by the sheer size of the land, the rising sun glinting of its metal surface. The man that sat next to Eduardo was his age and skinny, his elbows resting upon his knees. Over the wind he asked. You ever work the fields before? He smiled, his eyes expressing a sense of irony. Soon they pulled onto a dirt road, the suspension bouncing underneath and dust billowing upwards, as they headed towards a large building with a corrugated tin roof. The trucks pulled to a stop in the dirt circle drive. Juan patted Eduardo on his knee. The workers climbed out of the truck beds, and the foreman led them to the back of the building, where plastic white buckets were stacked, one inside the other, against the wooden exterior. They looked precarious, one stack leaning to the side, and the edges encrusted with dirt. They began to pull them down, and Juan handed Eduardo a razor blade. And then Juan took up a stack in his arms, and Eduardo followed suit, and they trickled towards the field as the foreman yelled. Step quicker, we ain't got all day! Starting on the Southwest edge, the men each lined up on a strawberry row and set the buckets down. Juan and Eduardo stood next to each other. There must have been a hundred raised mounds of narrow strips, the bushy plants almost knee high, running horizontally across the land. The strawberries were planted very close, sacrificing quality for quantity. The stalks drooped over from the weight of the berries, which lay sprawled along the ground while the dark green serrated leaves pointed upwards, small white delicate flowers growing from their tips. The foreman had pulled his truck up on the shoulder and now sat in the driver's seat, the radio playing. Within the first ten minutes Eduardo was falling behind, and Juan came up to him. No longer was there that sense of ironic calm; he was intense, his eyes focused as if worried, and he took the tool from Eduardo's hands and bent over and grasped the stalk and made quick precision like cuts and then dropped the berries into the plastic bucket and picked it up and moved to the next plant and repeated the motion and then turned back to Eduardo. And Eduardo bent over and began cutting again while a bead of sweat trickled down to the end of his nose and...dropped, soaking into the dry earth. His face was now set in concentration and a feeling of satisfaction formed as he began to move with adeptness and speed. Soon he was picking as quickly as the others, his back bent, clipping, filling and then moving on. The work was hard. By noon his back had begun to ache and he was covered in a strange odor from the pesticides on the leaves. His knees were covered in dirt and he was sweating heavily. The sun directly overhead and sweltering hot. Eduardo stood. The fields were spotted with white plastic buckets filled to the brim, near overflowing, with red succulent strawberries, men bent over and moving amongst the green. Eduardo wiped his brow with a handkerchief. From the truck, the foreman yelled. It ain't break time yet boy! And ahead of him, Juan turned around and gave Eduardo a knowing look. Eduardo bent over and continued on. At lunch they collected the buckets and brought them into the building. Inside men and women were sorting and packing. A conveyer belt shuttled the strawberries down and the workers stood along the edge, trimming and cutting, and pulling them into wooden crates that would be shipped to contracted supermarkets. They worked fast, largely ignoring the pickers; the dirt beneath their feet saturated with small green leaves, the constant loud drone of machinery in motion. Industrial fans anchored in the ceiling spun lazily, and the air was still hot and suffocating. Eduardo set the last bucket down and jogged to catch up with Carlos. They walked a short distance and stopped underneath the shade of a magnolia tree and sat down with the others, a view of the fields before them. The ground around them was spotted with weeds and a mongrel dog wondered about sniffing and wagging its tail. Eduardo, exhausted, sprawled his legs out and rested his back against the foot of the tree, his white shirt streaked with dirt and sweat stains that blossomed outward from the armpits. Juan patted him on the knee. They passed a water bottle back and forth and Carlos tore a tortilla in half and handed it to Eduardo. Gracias. How long have you worked out here? Let me tell you something my amigo, it doesn't get easier, but its better than Mexico. Where I'm from el men lay en waste full of watered mescal or taken to el drug trade, killing and robbing, the women whores... you married? That's good. Is she pretty? I hope once I settle down I will get a wife, but compared to the others out here, we are still very young. I believe I have time, no rush. I know lot of the men find American wives so that they can become legal, but they are cows! Do you think that they will have us back tomorrow? They sat quiet, their eyes growing heavy, the heat, almost comforting under the shade. Beyond the strawberry fields, a small patch of woodland, and then the soybeans. The road stretched into the horizon, birds spiraling on the thermals. Eduardo closed his eyes. What had brought the men together today was the same force that had brought the sun into the sky, the graceful path of the birds, the strawberries plump sweetness amidst the hard and mineral earth, and yet, something was different. As if what was necessary formed avenues of causality on which they strode, choices made, left turn or right. Carlos stirred and nudged Eduardo. His eyes fluttered open as if at first he knew not where he was. He pointed towards the foreman walking their way. Carlos laughed, that irony now returning to his eyes. He patted Eduardo on the shoulder. One by one the pickers rose and returned to work, with short reluctant shadows now falling behind them. Quitting time was almost upon them; the sun as if sinking into the earth, the remaining light a brilliant dissolution of red and orange. Eduardo paused for a moment and stood upright and looked towards the sky while stretching out his back. Eduardo turned to see Carlos working the patch next to him. His face was lined with creases, a fine spiderweb at the corners of his dark eyes, his lips turned up in a bitter smile. Eduardo turned as if to stop the conversation and continued working, wincing from the small scratches on his hands, and then a shadow fell in front of him. He looked up and saw Carlos standing directly behind him. Eduardo kept his head down, continuing to work. Why you work like a donkey? Eduardo stopped what he was doing and looked at him. You're out here just the same. It's what we got to do. Now leave me alone before he comes back ! Carlos shouted and kicked the dirt, and then returned to his row. It was dark. The sky was cloudless and many stars could be seen. Old mobile homes, on either side of a dead end gravel road, lay in a state of disrepair. Lights shining through the windows. Gutters that hung sideways, whole sides of vinyl skirting gone, plastic toys strewn across the yards, and satellite dishes attached awkwardly to the roofs. Old cars on concrete blocks and uncut grass. A group of children played in the middle of the road, and salsa music came from an old stereo. Men and women sat and stood under the glare of porch lights next to a wooden picnic table, a grill smoked, laughter rose up. At the entrance of the trailer park pine trees grew on each side of the road as if to shield the deprecation, and across the street stood a row of mailboxes, where an old beaten car sputtered past and turned, slowing. The gravel crunched under the tires, and it pulled into an empty driveway. The lights went off, the calm warmth of a summer night. The car door swung open and Eduardo stepped out and climbed up the sagging wooden porch steps like a man retuning from a long journey, weary, yet happy to be home. When he stepped inside he saw his wife at the kitchen table. She was short and plump with large breasts, a cute face. She wore a pair of shorts and a low cut blouse, her hair pulled into a bun. She was packaging a pair of tights into a plastic wrapping, and she looked up and said. Eduardo took off his boots and walked across the worn carpet onto the kitchens linoleum floor and kissed his wife’s cheek and then opened the refrigerator and took out a liter of soda and took a glass from the cabinet and poured himself a drink. It was hot inside and the windows were open. They had no air conditioning. An old tattered couch was in the living room facing a television set with rabbit ears. On the far wall, was a large cross and a picture of the virgin Mary with rosary beads hanging from it, the wallpaper behind a cheap yellow. The salsa music could be heard and laughter, the shrieks of the children as they played. Eduardo sat down on the couch and turned on the television and kicked his feet up. She stood and opened the oven and pulled out a plate and put it into the microwave. Eduardo ate while his wife went back to packaging tights. He fell asleep very happy and with a great sense of hope, and in the morning he rose and went back to the fields. His wife had packed him tortillas and he was happy that he could share them with Juan at lunch. Maybe on Sunday he could get a new hat. He would look sharp out in the fields with his new hat... and Carlos, boy was he loco.